Smil defines virtual water as “all freshwater required for [the production of] a crop or an animal foodstuff in the place of its origin” and recognizes it as a valuable accounting tool. Yet he also believes that Americans and other affluent consumers must adopt two additional practices if we truly wish to change the way we use and manage our water resources. The first is rational food production; for instance, the United States currently produces approximately 45 percent more food than is needed by its population. The second is sensible carnivory; Smil calculates that if Americans reduced beef, pork, and poultry consumption by a third, they could save a total of 120-140 cubic kilometers of virtual water over the course of a year (equivalent to the amount of virtual water used to make 15 billion leather shoes). For those who desire a more technical understanding of the concept, the article also goes into detail as to why some crops require more water, why the virtual water costs of dairy and meat products are so high, and why the amount of water saved by importing virtual water depends on the conditions in both the importing and exporting countries. 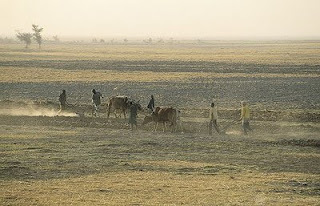 Photo: Men plowing fields in Mali. Virtual water would encourage arid countries like Mali to import food and devote their scarce water resources to other uses. Courtesy of Curt Carnemark / World Bank. I do not beleive that virtual water will help to insure food security or even water security am doing a study about that .. acualy virtual water concept will creat more political complications more than before and poor countries and countries with water scarcity will pay hight price for it .. its all political concept .. trade been there long time ago .. now they creat another concept that wont even help to secure water issues.